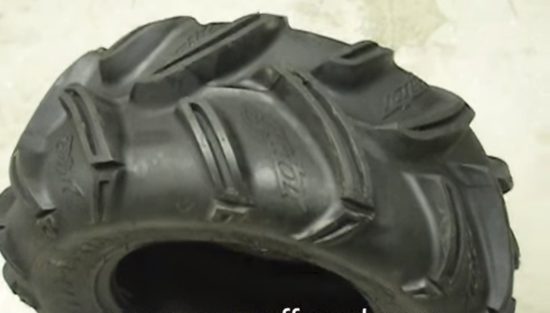 GBC Gator ATV Tires Review. Gator ATV tires from GBC Motorsports are a long time favorite among the mudding crowd. Even though they've been around for several years, they remain one of the most popular ATV mud tires. With so many radial tires available today their bias-ply design seems a little old school. But that balances out with the 6 ply rating, relatively lightweight, good wearability and value pricing. The tires feature widely spaced, dimpled deep lugs with some overlap in the center to improve ride quality. The Gator tires up to 25 inch diameter feature a 7/8 inch lug pattern and relatively lightweight. That makes them a good choice for smaller displacement ATV's and UTV's. Over 25 in diameter tires have a nearly one and a quarter inch lug, but are considerably heavier. While those tread depths are adequate for most muddy conditions, the gator tires are classified as a medium duty ATV mud tire. There are more extreme mud tires available today with larger lugs but the ride quality and trail riding ability suffer accordingly. The Gator tires actually work pretty well in most soft terrain riding conditions. Ride quality might not be quite as good as a general use tire, but it's not bad at all compared to other ATV mud tires. Speaking of those general use tires, it appears that GBC may be phasing out the gator in favor of the more basic use Grim Reaper and Spartacus radial tires. We're not sure if that's a done deal or not. Judging from the many positive reviews of the Gators, a lot of happy owners will be disappointed if that happens. It's hard to find someone that wasn't happy with their GBC Gators. the only consistent complaint we found were from those that tried to use them in deep sand. Of course that's not what they're designed to do. The problem was that the tread design was so efficient they simply dug holes in the sand! As long as the ground wasn't too hard or rocky, most owners gave the GBC Gator tires high marks in overall trail riding. Several mentioned that they work really well in the snow. Many mentioned that the ride and handling were better than other ATV mud tires they had tried. If you do have trouble finding GBC Gator ATV tires it appears that the GBC Spartacus is the most similar in tread pattern and mud performance. It does have the added advantage of being an 8 ply radial.